5S, an aspect of Lean Thinking, is a system to arrange work areas as efficiently as possible. If every task whether a chore or hobby requires a search for necessary tools to get started, the likelihood of completing the task decreases. So throughout my home I organize work and hobby areas to make tasks easy to start and complete. To maximize efficiency with gardening chores, I have a workstation with bug spray, sunscreen, and garden tools at 3 different locations. One is in a small greenhouse at the vegetable garden, one is in the garage, and the other is on the backyard deck. Wherever I am in my yard, a workstation stocked with tools is nearby. This saves time because I can begin gardening tasks without searching for tools. 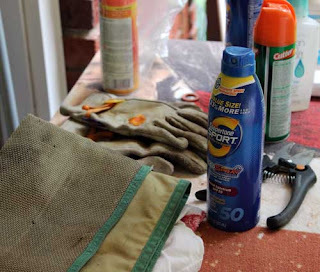 Looking 30 minutes for a favorite pair of gardening gloves is a reminder to keep my work areas organized. Indoors, each bathroom cabinet has cleaning supplies. This saves time and energy when I'm ready to clean. Otherwise wasted time and wasted movement is spent gathering cleaning supplies. My office is arranged so things can be reached with little disruption to ongoing work. Files, notebooks, notepads, pens, and calendar are all in easy reach. Similarly, I have organized areas for photography, scrapbooking, and other hobbies. Every 4 - 6 weeks, I reorganize work areas using the 5S system. 5S represents sort, set in order, shine, standardize, and sustain. So I replace supplies that are worn out or empty, dispose of items that I don't use, and tidy up the areas. 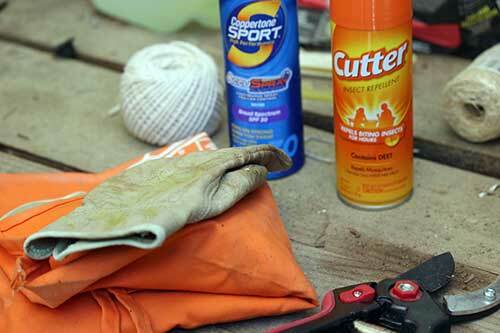 I also make sure the more frequently used tools are convenient to reach and easy to find. Lean Thinking is all about reducing waste, and Shigeo Shingo classified 7 wastes. 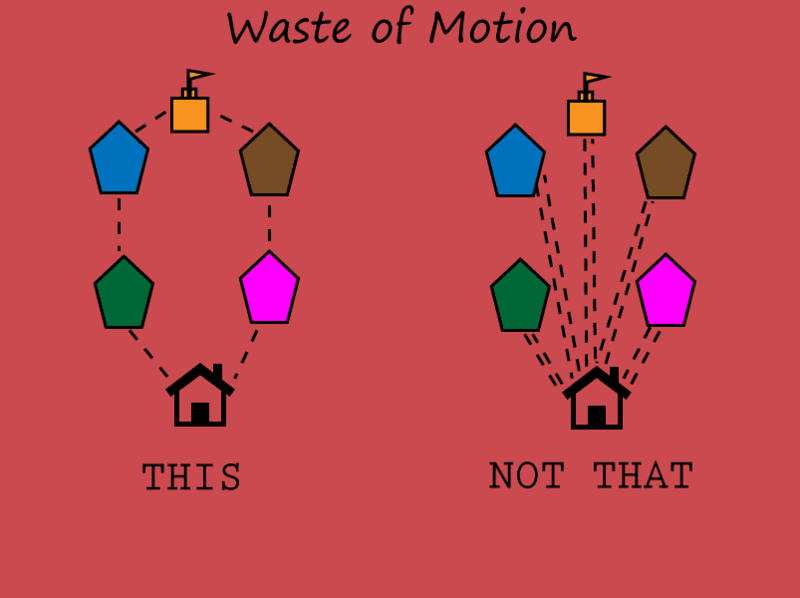 Waste of Motion is one I try to avoid at home. 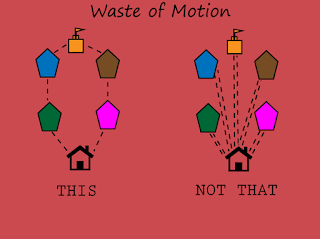 Many activities in the home can be standardized to reduce waste of motion. I collect a batch of bills and then pay them. Paying each bill as it arrives in the mail would involve opening the envelope, sorting the paperwork, logging into a website to make a payment or writing a check, recording the check or debit in the checkbook, and filing paperwork. Processing a batch of bills at one time saves duplication of motion. Along the same lines, I let several cups and bowls accumulate on the counter before I open the dishwasher and load these items. Errands can be organized in a route rather than individual spontaneous trips. This saves gasoline and time, as well as reducing waste of motion. Lean Thinking is using common sense to perform tasks in the most efficient manner. Before it was called "Lean Thinking" people were practicing it to get things done efficiently. Later, it was further defined to apply to workplaces. So go full circle with Lean: do it at work and do it at home, and you will be more productive for it! In 2014, I wrote about the basics of Lean Thinking. You can access that post by clicking here. Sunil Kaushik has written about using Lean Principles to minimize travel expenses to Egypt. 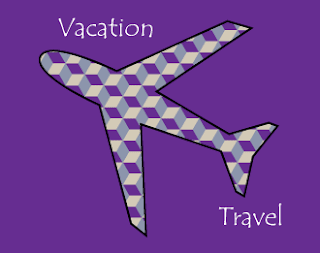 Mr. Kaushik, an ASQ Influential Blogger, definitely has expertise in traveling cheap. The article can be found by clicking here. I do the same at home; my wife is a professional using 5 S's at home, and really saves time and money... It is a good idea when you take your Black Belt experience to your personal life ! I agree completely! Thanks for the comment. Really nice sharing dear this is one more biggest trick that may help us in applying the lean or 5s strategies in business and homes as well thanks for sharing.